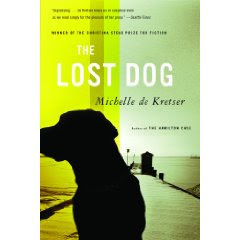 I have five copies of The Lost Dog by Michelle de Kretser to giveaway--courtesy of Hachette Books! About the book: Tom Loxley, an Indian-Australian professor, is less concerned with finishing his book on Henry James than with finding his dog, who is lost in the Australian bush. No need to enter me, I have read the book and enjoyed it very much. It has been nominated for more than one literary award and won at least one that I know of. No need to enter me in the contest. Just posted on Win A Book. Please count me in for the giveaway. Thanks. Please enter me in your draw. I would love to win this. I think this one sounds really interesting! Please enter me. I've read several reviews of this book and it sounds very interesting. Please enter me. The more I hear about this one the more I want to read it. Especially since it's set in Australia. :0) Count me in! I am a email subscriber and would love to win this book. I read Wild Dogs by Helen Humphreys several years ago and would find this book an interesting comparison. Would love a chance to read this book....thanks. +1 This sounds like my kinda book. Please count me in! 2. I followed your blog (sunnyview99)! Thanks for the chance to win a copy. This looks like an interesting story. I'd love to read this book - please count me in. Thanks! Please enter me in this giveaway ~ THE LOST DOG sounds like a wonderful read. + I've been a follower for awhile now. I'd love to read this book=) Thanks for the giveaway! This looks like an enjoyable read. THanks for the chance to win a copy. I just became an email follower of your blog. And I posted this giveaway on facebook. Thank you for this giveaway and pleas count me in. I'd love to go to Australia some day and love to read about it! Looks like a great read... Please enter me. Thank you! I would love to win a copy of this book! I have heard so much about it.